When FELTspace opened in 2008 it was with an optimistic air of professionalism that had previously been missing from Adelaide's emerging contemporary arts scene. With a focus of community involvement, that initial spirit gained momentum and proved to be contagious as it spread into other start-up institutions and the practices of individual artists. Now, three years on, the FELTspace GOLD book and accompanying exhibition represent an important coming of age for an Artist Run Initiative (ARI) with newfound authority. At first glance GOLD is a triumph. With the contributions of four arts writers it documents an impressive range of work that spans a wide variety of disciplines. So accomplished are its production values that it could easily be the catalogue of a major Biennial. It’s only when we consider the larger history of the ARI as an institution that GOLD’s appearance becomes strange. When ARIs first swept the globe they were sparked by the legend of The Young British Artists (YBAs) and their ability to court media attention with their innovative entrepreneurship. Ultimately, the tale of those cunning Thatcherites outlines the advantage gained by artists who set themselves apart from the conventional avenues of ascension. When this is achieved a new audience can be attracted to contemporary art and, with it, comes true independence and autonomy for the artists. Now, twenty years on, some of the entrepreneurial spirit has disappeared as the ARIs have been consumed by government funding bodies hungry for 'grass roots’ authenticity. The homogenising force of private sector commercialism was scorned in favour of the homogenising force of government involvement and subsidy. The reward was the supposedly infallible pretence of being avant-garde. While a few ARIs maintain an anti-establishment stance, the loudest have come to reflect the aspirations of their parent institutions. Of this type, FELTspace GOLD is a prime example. I make this claim based on the fact that FELTspace GOLD is perfect; it’s the perfect summation of everything that a survey catalogue should be, which makes it, inadvertently, redundant. With its humorous title you could even be forgiven for wondering whether it’s a parody of its form. Choosing to follow the traditional avenues of ascension in this way seems a little subservient when the alternatives are so obvious. In this age of new media when, for the first time in history, artists have little need for intermediaries to reach an audience, why would an ARI choose to publish a large and glossy catalogue of their achievements? The answer seems to be that FELTspace is in pursuit of an audience that already exists rather than forging ahead to find its own. This is confirmed if we consider the central claim of the publication. FELTspace GOLD presents a "survey of the brightest emerging talent in South Australia" which is a group that includes the FELT committee and the authors. This claim might have been a little easier to accept if the almost identical claims made by CACSA’s The New New weren’t still ringing in our ears. With almost identical claims made by two South Australian art institutions within the space of a few months we must conclude that FELT’s claim is either a challenge or a case of mimicry. But even if it were a challenge, FELTspace GOLD, in following the standards of larger institutions, has missed an opportunity to establish its own standards. Ultimately this is a failure to recognise its real power as an alternative rather than as an adjunct to something larger. This current direction actually reinforces the notion of a hierarchy in which ARIs, like FELT, are just the first rung on a straight and narrow ladder rather than a force of their own. The only real drawback to this approach is that it does less for the artists than an ARI otherwise could. But as a young artist copies the style of the masters there must, hopefully, come a time that the pupil finds their own path and does something new. This must also be true for institutions. In this time where “professional” is often just a byword for “conventional” I’d like to see FELT’s optimism flower into something truly radical. Better yet, something radically unprofessional. Perhaps the committee behind the curtain at FELTspace are already planning a brilliant subversion of the established standards of contemporary art, which they have, admittedly, mastered. Perhaps FELTspace GOLD is that brilliant subversion, albeit a very subtle one. I hope so. 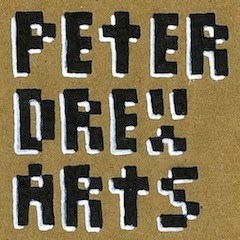 This blog features the published articles of Peter Drew. Born in Adelaide, Drew is a freelance arts writer and street artist. He currently lives in Glasgow, Scotland.